Introducing our very own skimmer, The Ultraskim is the latest and probably the newest design on the koi market, designed by the Koi Professionals for the true Koi enthusiast. The Ultraskim has been designed to build into the top of the Koi Pond wall at the time of construction, they are exactly the same dimensions as the standard concrete block (18" x 9" x 4") so it is just a matter of leaving out one concrete block to allow the Ultraskim to fit firmly into place. The Ultraskim comes with a 3 inch Socket outlet to gravity feed in to a Ultrasieve III, Ultrasieve Midi or an Eazy Pod, in fact you can gravity feed in to almost anything you like. The 3-inch socket will allow a greater flow of water and will not get blocked with leaves or other debris. Most skimmers on the market have a 1.5-inch outlet, which simply isn’t big enough to gravity feed most filters the modern koi pond demands. 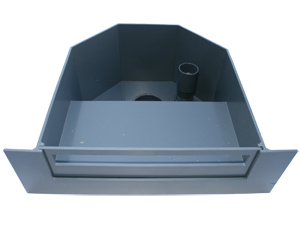 The Ultraskim comes complete with a lid and a 1.5-inch adjustable overflow, The Ultraskim is available for concrete pond design or supplied with a pre-drilled flange for those of you going down the liner route. Another of the Ultraskim features, and it has many, is the adjustable front plate, which allows for that margin of error or a fluctuation in the actual water level as this plate can be raised or lowered to suit the water level at the time, no other Surface Skimmer has this provision! The Surface Skimmer is quite an important piece of equipment for any koi pond and it is more often forgotten about at the time of constructing the pond. If you are going to build a new Koi pond then please don't forget to fit one of these surface skimmers, on larger ponds two or more may be needed and these are built into the walls of the pond at the time of construction. 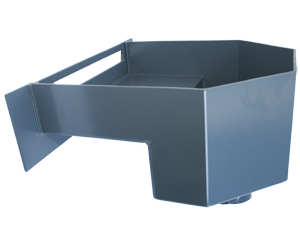 The primary purpose of the Ultraskim is to skim, or pull off, floating debris and even dust from the surface of your pond, however by using the Ultraskim, into a Ultrasieve III or Ultrasieve Midi you can then add extra filtration to you pond, in to an Ultrabead or Econobead Bead Filter, Eazy Pod, you can even add a Bakki shower, your options are simply endless. One more thing, there is very little point in using a skimmer to skim off the floating debris and allowing the finer particles and dust to return to the pond again, do the job once and do it right, fit yourself the New Ultraskim exclusively from Absolute Koi.